TEST PIC ........ NO TOPIC - Lake Houston Fishing! 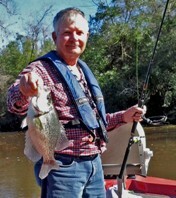 you can't catch no crappie going that fast. just kidding with you; welcome to the site. No, but I bet I've eatin a few up and spit um out tha back. Thanks for tha welcome. Its great to be here and I fully intend to meet as many of you as I can. I'm just trying to see how things work here. I bounce around to 3-4 forums and of course their all a little different. Good to see this one is pretty easy to figure out especially when it comes to posting pics. I assume there's annual dues or member donations to help support this site. Im gonna also assume there's no maximum. Question is is there a minimum? you should talk to Forrest about that. Because it does cost him to run this nice site.